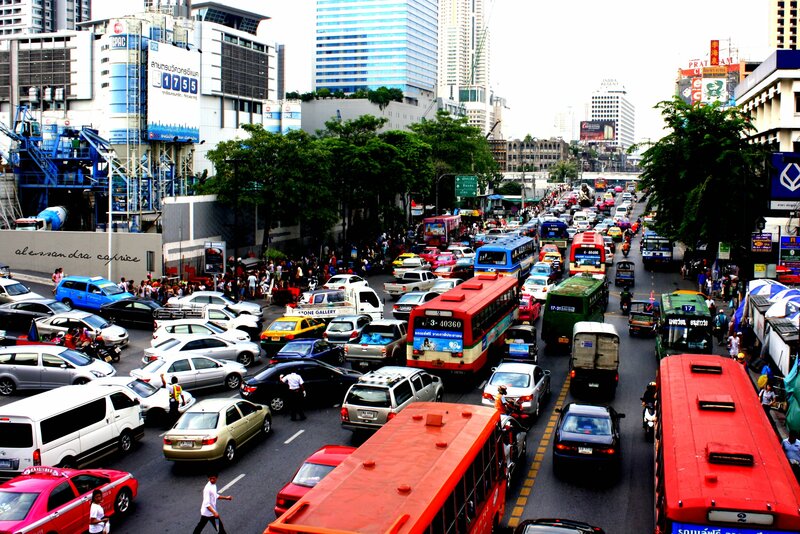 To say I was overwhelmed when I arrived in Bangkok would be a drastic understatement. I’m from Los Angeles, and even though I was raised in the suburbs, I still thought that I was from the “big city.” All those misconceptions came crashing down when I witnessed the constant bumper to bumper traffic, the massive amounts of people, and the sense of lawlessness that reins the city streets. It took me weeks to get used to this bustling city and my sentiments went from pure hatred to a peaceful understanding. I learned to appreciate the city, even almost love it, despite my initial misgivings. 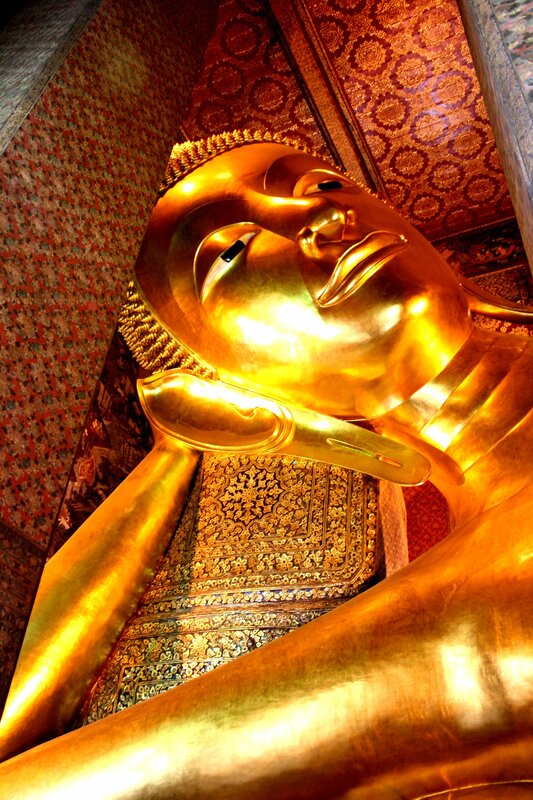 A traveler can definitely be overwhelmed with all the activities to do in this insane metropolis, so I’ve decided to compile a few of my favorite places and things to do while in Bangkok. 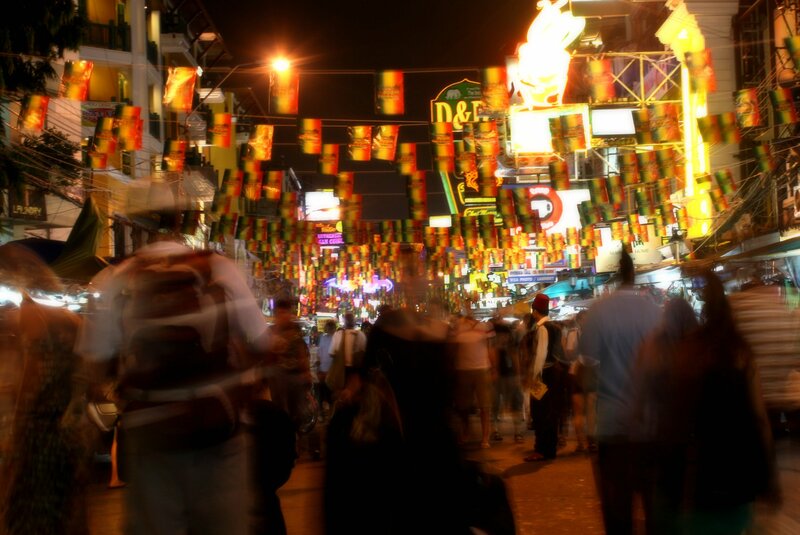 Khao San Road is a backpacker’s haven. There are cheap guesthouses , even cheaper food and most importantly, countless places where you can grab a beer and people watch. And people watching is at its finest here. A traveler can run into a person from pretty much any country in the world here, having a beer with a group of Scottish businessmen one night, sharing a taxi with an elderly couple from New Zealand for lunch, while shooting some pool with frat boys from New Hampshire before dinner (although I have to say Americans in Thailand are few and far between). I have never in my life heard so many languages being spoken as I amble down the street (and I’m from Los Angeles!) or paid under a US dollar for a big plate of Pad Thai, cooked right in front of me while I shop. I wouldn’t recommend staying too long here because I believe there are other great places to stay in Bangkok, but its definitely a must for every traveler looking to experience a true backpacking scene. I have experienced this magnificent river from two settings: a personal longtail boat ride through the various channels and the Chao Phraya River Express, the public means of transportation up and down this waterway. Both are wonderfully unique in their own ways. I’m not exactly sure how I ended up paying 1500 baht for a solitary boat ride touring a part of Bangkok I had yet to see (I think it had something to do with a genial con man on the side of the road in cahoots with a tuk tuk driver who quickly swept me away to the pier), but as a photographer, it was 100% worth it. 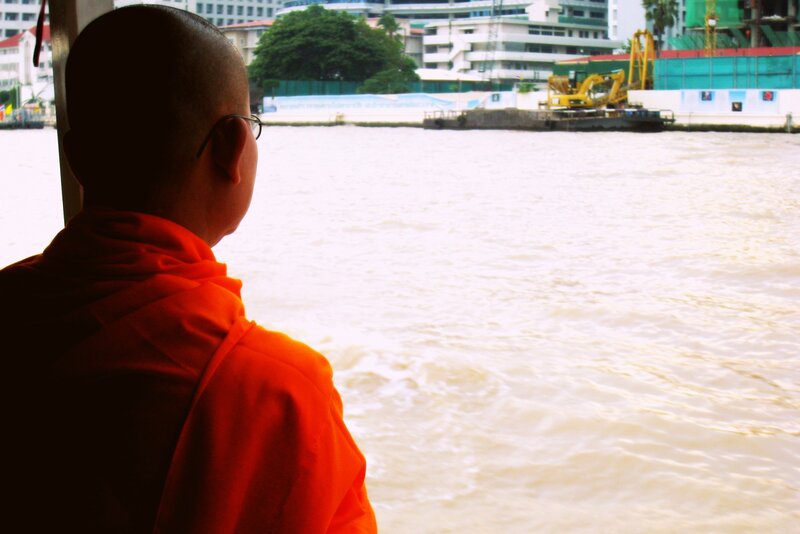 I got a little insight into Bangkok life outside of the honking horns and the chaos. I witnessed houses built on stilts above the water and a floating market that even included a Nestle boat. It was extremely peaceful and even though I couldn’t get the fact that I paid 1500 baht for the ride (I would definitely advice haggling, this was one of my first days in Bangkok and had not mastered this art yet), I loved every second of it. The Chao Phraya River Express is a different story. Its somewhat crowded, only 14 baht (sometimes 18 baht, but I never caught on to why it was more expensive some times over others), and it brings you to all the major destinations along the river: The Grand Palace, Wat Pho (home of the reclining Buddha), the flower market, China Town and many others. Its an easy way to get to the Skytrain from Khao San Road as well if you’re not up for shelling out the dough for a taxi. I’m not sure if this is Asia’s largest open air market, but to me, it feels like I’m in another world. This place puts Southern California Swap Meets to shame with its rows and rows of glorious knick knacks and souvenirs, wicker furniture and idolistic statues, t-shirts with creative and most of the time derogatory sayings, and every animal you can think of whether it’s supposed to be a pet or not. It really takes a lot of self control to not buy something from every single stall. Suitcase restrictions aside, I have definitely considered buying an authentic Thai silk bedroom set (complete with pillows and duvet), a mahogany dining room table, and even a puppy. This place is dangerous and despite a slight sense of claustrophobia while perusing the infinite aisles, it is an absolute must for anyone visiting Bangkok on the weekend. 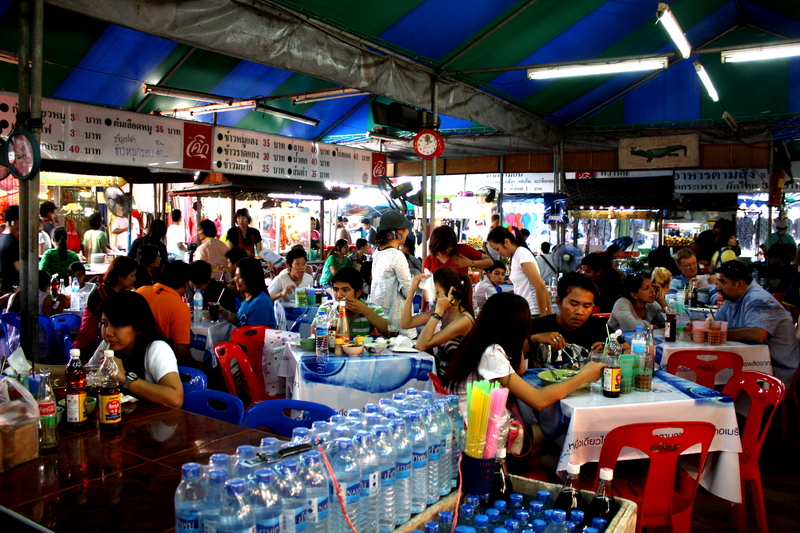 Note: From the Khao San Road/Soi Rambuttri Area you can jump on Bus #524 to the Weekend Market. They don’t have shopping malls like this in California. And they certainly don’t stack four different ones within a 2 minute walk from each other! These six to seven level malls are packed, and I mean packed, with fashionista tourists, teenagers, and families all searching for that next big purchase, and although most of the high end shops always seem to be empty, this is the place to be seen. Siam, the hub of the Skytrain, is at the center of it all. People watching and most importantly, traffic watching here is surely at its best in this lively part of town. A traveler can see a movie (don’t worry, they’re in English and dubbed in Thai), dine at a French sandwich restaurant, buy a camera to replace that one you dropped into the Chao Phraya River (even though everything else seems to be cheaper in Thailand, electronics are not one of them), and board the Skytrain to experience Bangkok at high speeds. A definite must for any traveler yearning to see chaos at every turn. Note: From the Khao San Road area you can jump on Bus #15 and it will bring you right into the center. You can also catch the Chao Phraya River Express to the last stop and board the Skytrain there. The temples of Bangkok are endless. There is seemingly one on every corner and the phrase “If you’ve seen one, you’ve seen them all” definitely does not apply here. I was conned into embarking on a tour of temples (a con that Lonely Planet warns travelers about, but I decided to read this little tidbit an hour after I got back from the joy ride), which I ended up loving, so I soon forgot about the dishonesty that had taken place (he had told me that the Grand Palace was closed and that he could drive me around to various destinations while it opened up), plus it was raining and I didn’t want to get soaked. I never saw two Buddhas that were the same. Each temple has a different take on the holy idol and I was interested in seeing them all. I was taken to a secluded temple and told that if I make a business-type wish in front of a certain Buddha, it would come true. (I won’t tell you what my wish was, but I can assure you it has not come true yet, at least as far as I know). I would also recommend the Golden Mount. It’s a nice little walk and at the top there is a gorgeous panoramic view of surrounding Bangkok. At Wat Mahathat (near the Amulet Market), English speakers can actually take a free course on meditating. The man who leads the class speaks flawless English and is extremely insightful. Walk-ins are welcome and he will teach you as long as you would like. You can see my blog post on my meditation experience here. Bangkok has a little something for everyone and my growing admiration for the city makes me miss it sometimes (I’m only an eight hour train ride away). I look forward to being back in the City of Life in a couple weeks! Great post, so helpful for those who are new to the city. I also really liked Chatuchak Market Weekend Market, you could spend all day there getting lost in the stalls. As a side note you can also take the skytrain or subway there, I can’t remember which one now. Yeah! You take the Skytrain to the Mo Chit exit and its right there!! I have always been a traveler- for me I was hitch-hiking across the states when I was fifteen, but now- almost 15 year later I am having to play it by the book- the school book that is- It is much more difficult than the way I used to be… But I miss it, there is something to be said for learning through adventure vs. someone elses adventure. But none the less- I have never been to Bangkok, this blog has made me want to go. : ) and as soon as my schooling is over, I will try and make it over that direction.